Skiing can play havoc on your knees. High speed descents, uneven slopes and extreme weather conditions, not to mention knocks from other less competent skiers, all combine to form a dangerous cocktail of risks. If your fitness is not at peak condition or your knee ligaments are already weakened or injured, the risk of further injury is greater still. This guide will give you a brief overview of how to protect your knees when skiing, enabling you to enjoy a worry-free holiday this winter. The absolute best protection for your knees when skiing is quad muscle strength and if your fitness is not at its peak, your muscles can let you down towards the end of the day when you’re tired. So whether you need protection for a knee that you’re unsure of or you have a previous injury that may or may not have been repaired, you need a knee brace for skiing to provide protection and ensure that your holiday is a great one. There are many soft knee braces on the market but these will not give adequate control in high-impact situations. A well fitted rigid shell knee brace will provide protection and support all the main knee ligaments, enabling your full joint range to give great control and precision of movement. By providing the confidence that you need, this in turn will protect you against further injury while out on the slopes. In the long term, a knee brace for skiing will enable you to strengthen controlling muscles by reducing the instabilities in your knee. 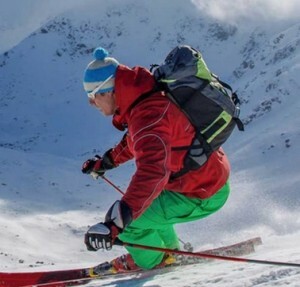 There are many knee braces that can be bought online or off the shelf but when choosing knee protection for skiing, it’s important that your knee braces are assessed and fitted correctly. Our reputable, well-established clinics have extensive experience in knee bracing and we have been providing the best since 1993. All of the clinician Orthotists at Technology in Motion are registered experts in their fields, and our knee bracing specialists provide quality solutions for patients with injuries and conditions of all kinds. We provide knee braces from major suppliers such as Ossur or DonJoy to ensure optimal quality, consistency and value for money. Their lightweight carbon fibre and aircraft aluminium braces provide firm and comfortable control while offering maximum levels of adjustability and support. Essentially, it’s like wearing a crash helmet to protect against the disaster scenario. A well fitted knee brace will give maximum support to the knee and provide four-point control, to protect all the major knee ligaments. A good brace will also allow for controlled flexibility in the femoral and tibial areas, allowing your muscles to work effectively. All in all, it needs to be strong enough to absorb high activity impact without becoming cumbersome and uncomfortable over time. As part of your kit, a well fitted brace will offer comfortable and effective knee protection for skiing, leaving you to enjoy your holiday without worry. If you would like to enquire further about our knee bracing solutions, contact Technology in Motion.